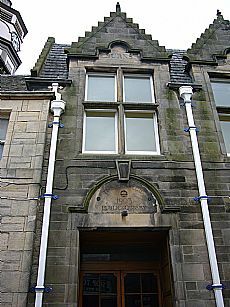 This building is now part of Dingwall’s Town Hall, but as the inscription shows, it was the original Dingwall Library, opened in 1903. It is a Carnegie Library, constructed with part funding from Andrew Carnegie, a wealthy Scottish-born entrepreneur who endowed a number of libraries throughout the world. Andrew Carnegie was born in Scotland in 1835, but immigrated to America with his family in 1848. Making his money primarily from steel, he donated much of his fortune for good causes. He funded over 2500 libraries, over 600 in Scotland alone, between 1883 and 1929. The libraries were designed and built locally, and show a great deal of variation. In a tradition which continues today, Carnegie required that most of the communities provide some match funding, and that they demonstrate need, provide the site and contribute to the costs. Perhaps not so common today, he also required that the resulting facility provide free service to all. In Scotland, as a condition to funding, councils and burghs had to adopt the Public Libraries Acts, which were applied in Scotland from 1853. Carnegie had a fondness for the Highlands, purchasing Skibo Castle in 18 98, spending millions on its renovation. 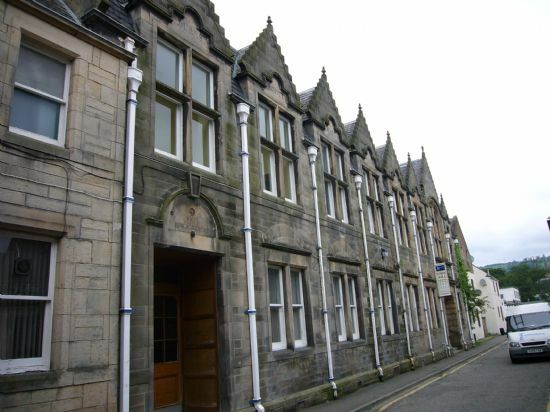 In the Highlands, Carnegie libraries include examples at Wick, Thurso, Dornoch, Cromarty, and Tain. 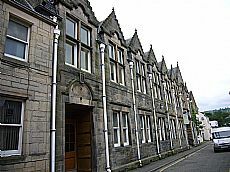 In some cases, as at Tain, the building continues in use as a library, but elsewhere, as at Dingwall, it has changed in function. The inscription above the door records ‘The Carnegie Public Library 1903’, and above the gables are names of important Scottish figures and authors including Burns, Wallace and Knox.